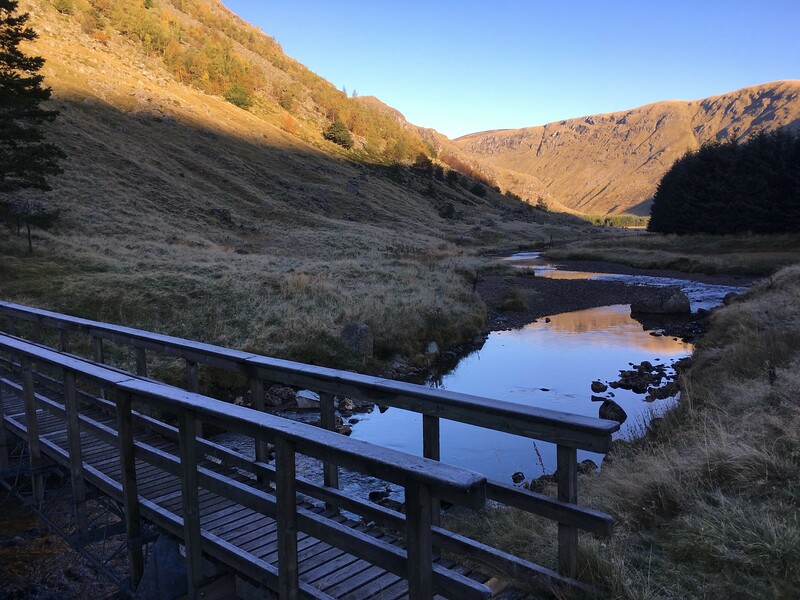 I'd been planning to do these two from Glen Doll for a couple of years, and with the weather looking set fair last Sunday I decided to bite the bullet and get it done. 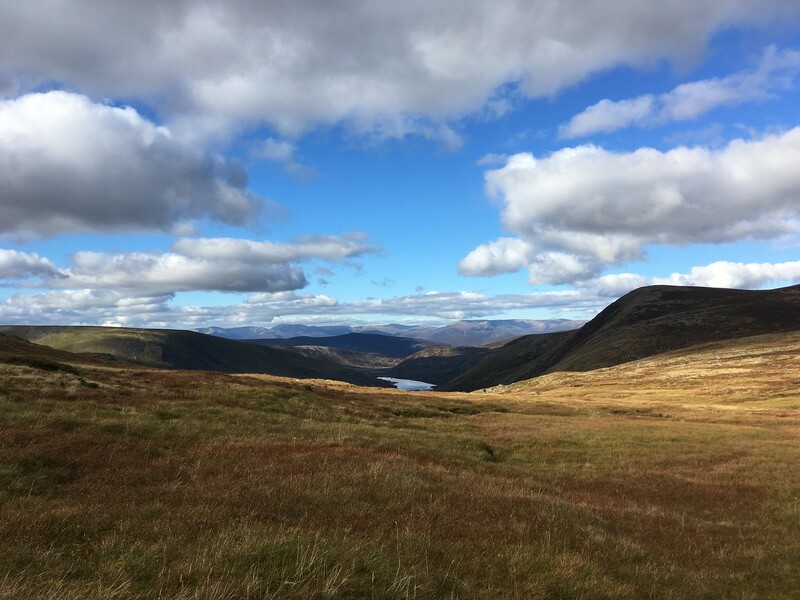 The plan was to approach the hills via Bachnagairn and Loch Esk, and return via Jock's Road, making a nice circular route. But the best laid plans etc...more of that later. It's a fair old drive from Glasgow to Glen Doll (about 2:15), and the final approach was interesting...the road was littered with pheasant playing chicken with my car - there were hundreds of the crazy buggers! I think I managed to avoid them all however and having paid my £2 I was ready to set off about 8.30am. I started by leaving the far end of the car park, crossing the bridge over the river and then turning left onto the track that leads to Moulzie. A light frost covered the grass and the sky was completely cloud free - perfect walking weather. There were various signs posted around the place warning of a footbridge that had been washed away north of Moulzie, and suggesting a slight detour which I followed. 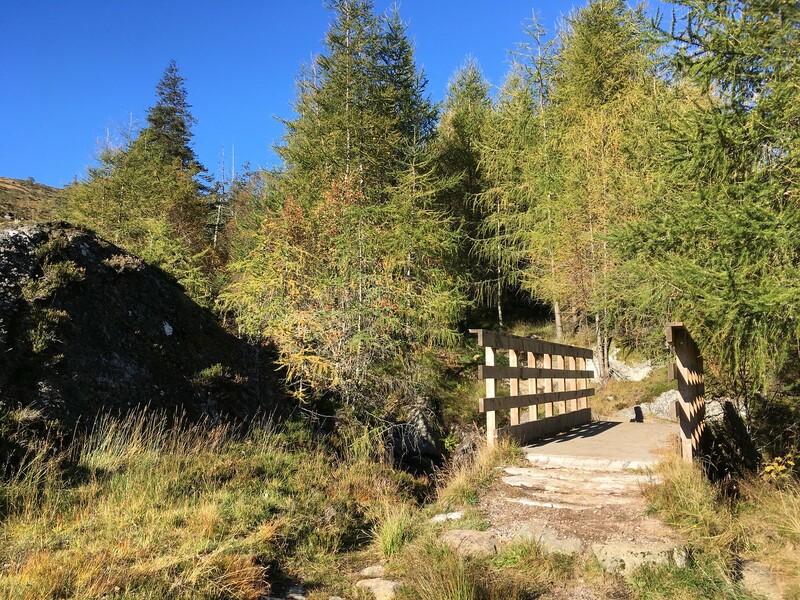 Basically it involves crossing back over the river on a footbridge just south of Moulzie and following a feint but perfectly adequate path on the west side for a kilometre or so before joining up with a more substantial track leading all the way to Bachnagairn. 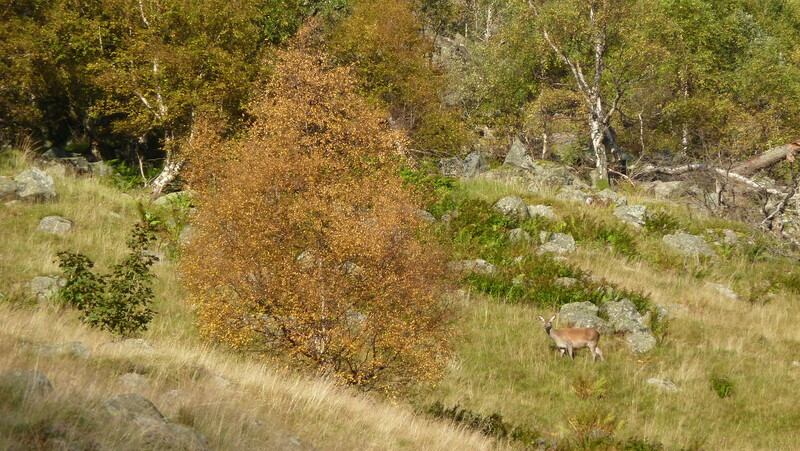 From this point on, more or less for the whole walk, the air was filled with the bellowing of Red Deer. I came across quite a big herd on Tom Buidhe (one stag with a harem of about twenty-odd), but the only one I managed to picture was on the slopes just above the diversion route - a lone female keeping a wary eye on me. 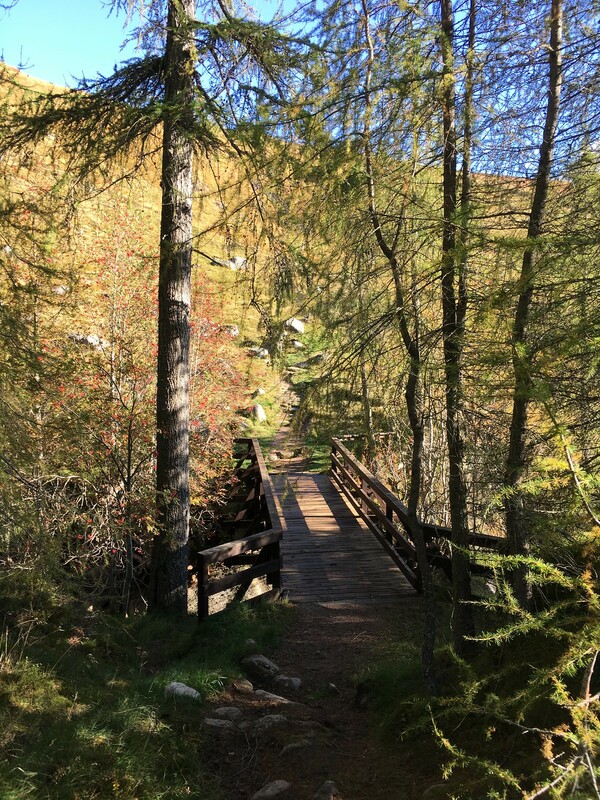 As it approaches Bachnagairn the track gradually becomes rockier and steeper before ending at the footbridge that marks the entrance to the forest. 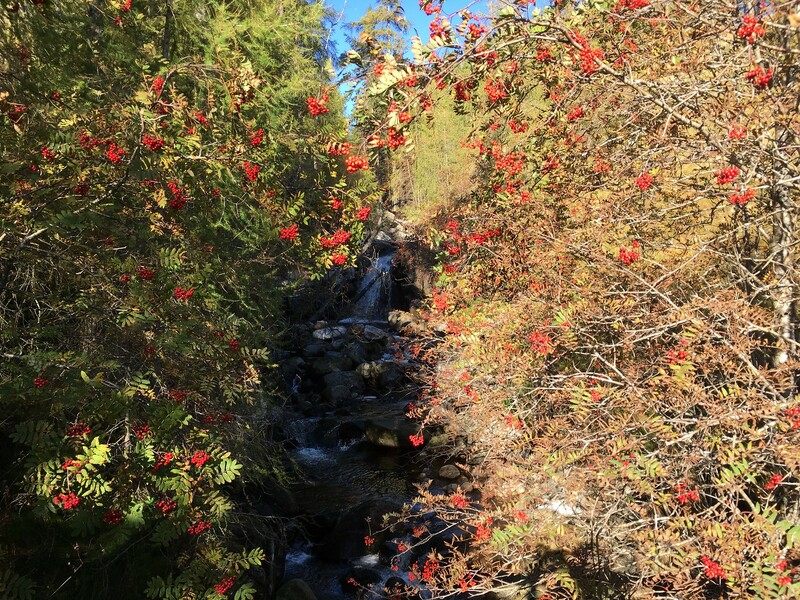 It's quite a small patch of woodland, but quite pleasant, with the sound of waterfalls all around. About halfway through the path forks, with the option of heading back over the river to the right. This looks like a possibility for doing Broad Cairn later, but for now my path was taking me straight on and out the other side of the forest. The path begins to climb a bit more steeply as the trees gradually begin to thin out. The path is very well made at this point - indeed it looks quite new. 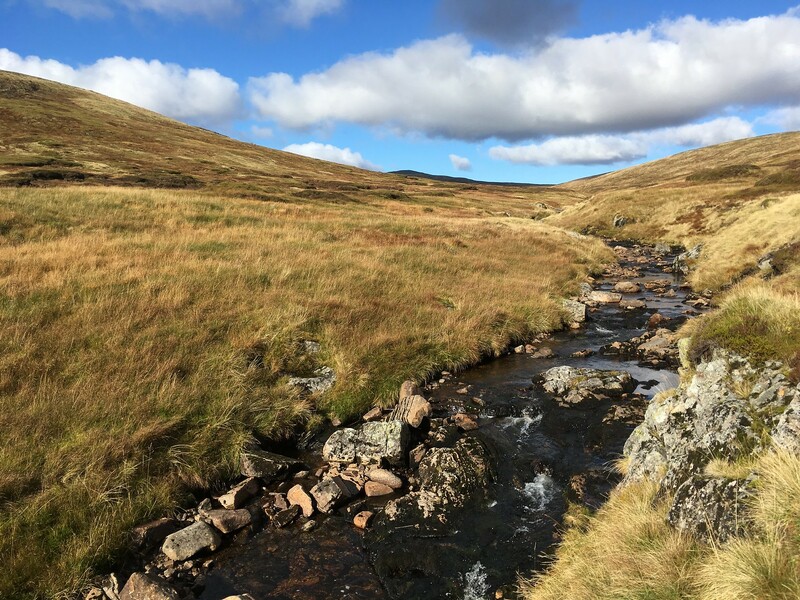 After a while the path takes a sharp left turn and begins to climb away from the river and towards the the hills that are the object of our walk. 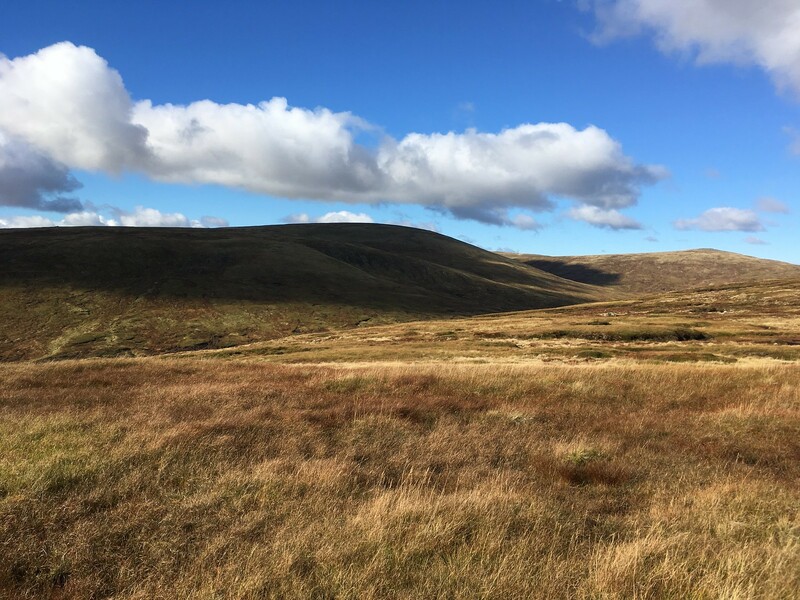 This section of the walk is marked on the OS map as "Glittering Skellies" - presumably because "Featureless Bog" wouldn't look as good. I saw nothing glittering and I don't know what skellies are, so I've no idea what this is referring to. 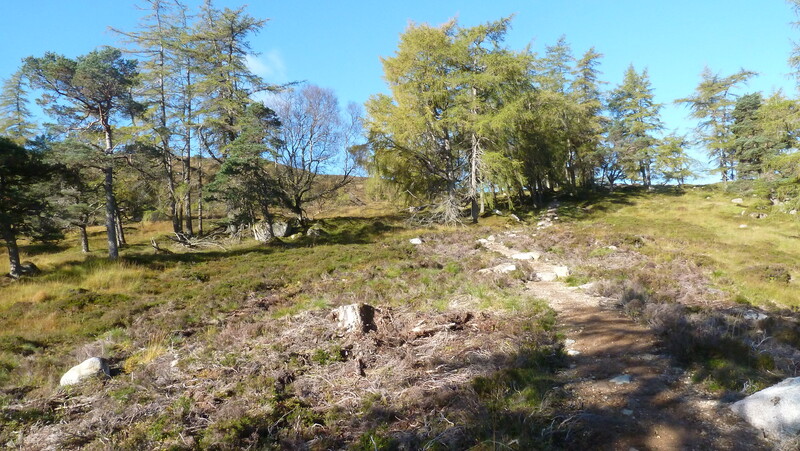 The path gradually becomes less and less distinct and more boggy as it climbs towards the junction with Jock's Road, but there are some small wooden waymarkers to help you out. 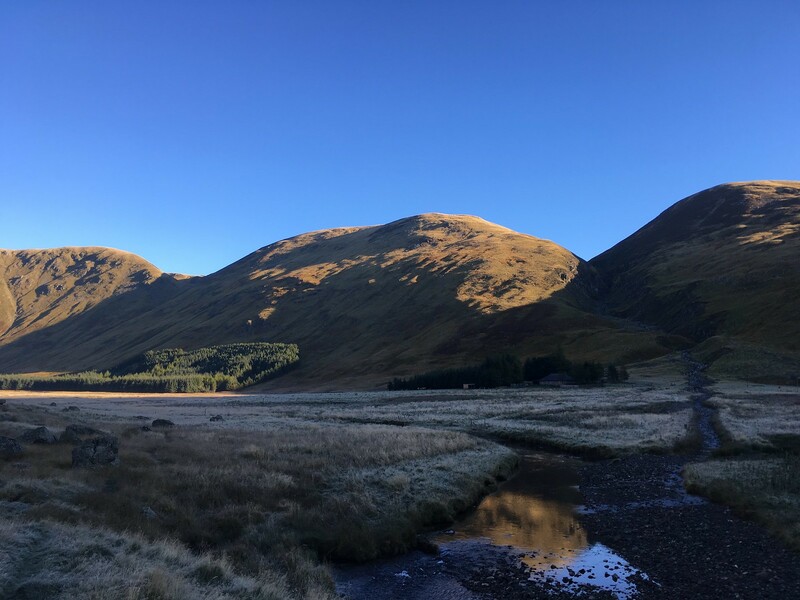 After a while Loch Esk appears on the right...it's more of a lochan really, but I noticed some birds on it so I got into my rucksack to get my binoculars...and then realised with a cold horror that I'd left them back down the path at my breakfast spot! Disaster!! 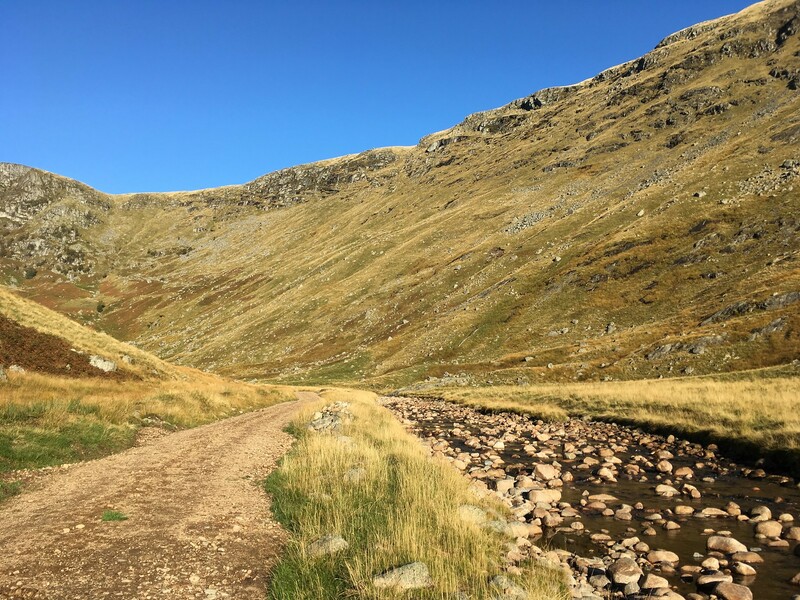 Once the path meets up with Jock's Road (also just a path at this point), the next decision has to be made...how to tackle the two Munros that were the object of the day's walk. I decided to just head straight towards Tom Buidhe. This involved quite a sharp descent towards the White Water...I couldn't see the stream from the path, so just trusted that the crossing wouldn't be a problem, which turned out to be the case - just a hop over with the aid of a couple of boulders. Once over the White Water it's basically a trudge up to the top of Tom Buidhe. There's no path that I could see, but the going is fairly good, with mostly short grass and the odd peaty, boggy bits to contend with. 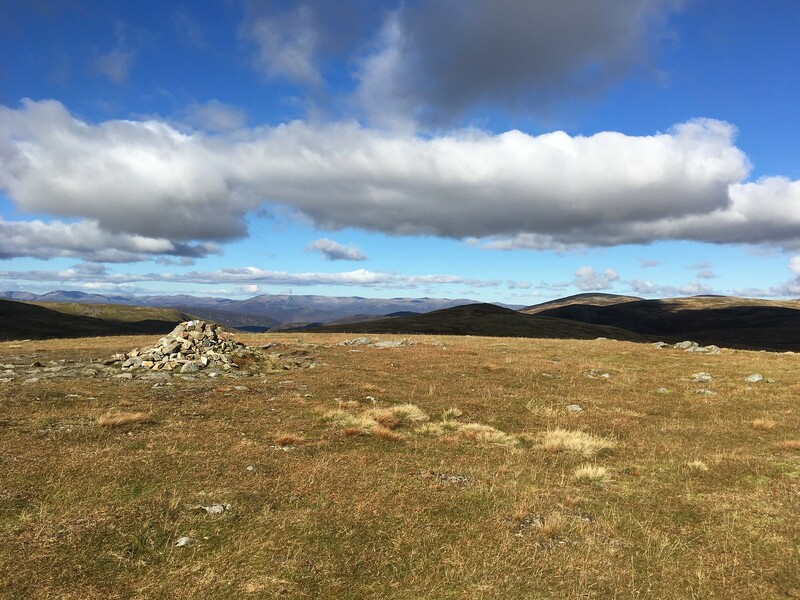 Tom Buidhe isn't going to feature in many people's list of the most beautiful Munros - it's just a round, featureless lump with a modest cairn at the top. From here the summit of Tolmount looks just a short stroll away...which is indeed the case. 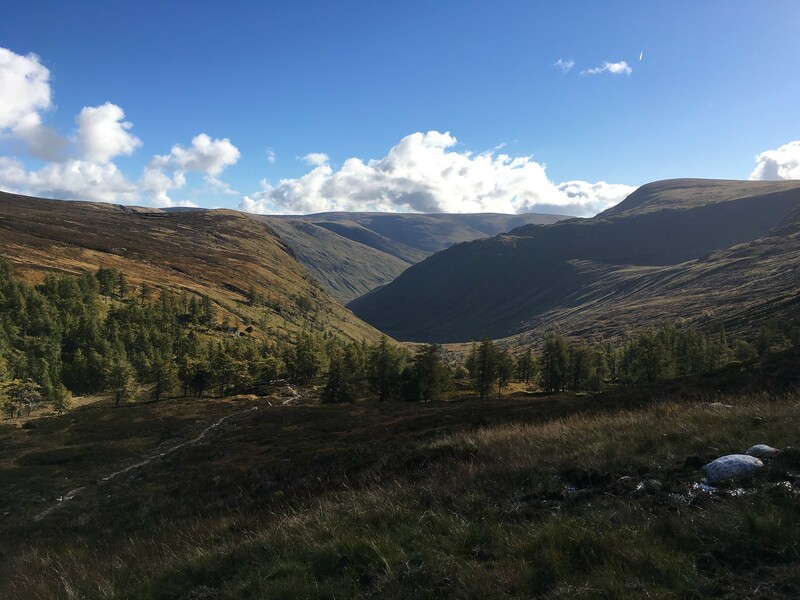 I considered just heading straight for it, but luckily I picked up the path that heads NW for the bealach and then turns NE to climb at a more gentle rate than would otherwise have been the case. It took about 30 minutes to get from the top of Tom Buidhe to the top of Tolmount - a slightly more characterful summit, but not by a huge margin. 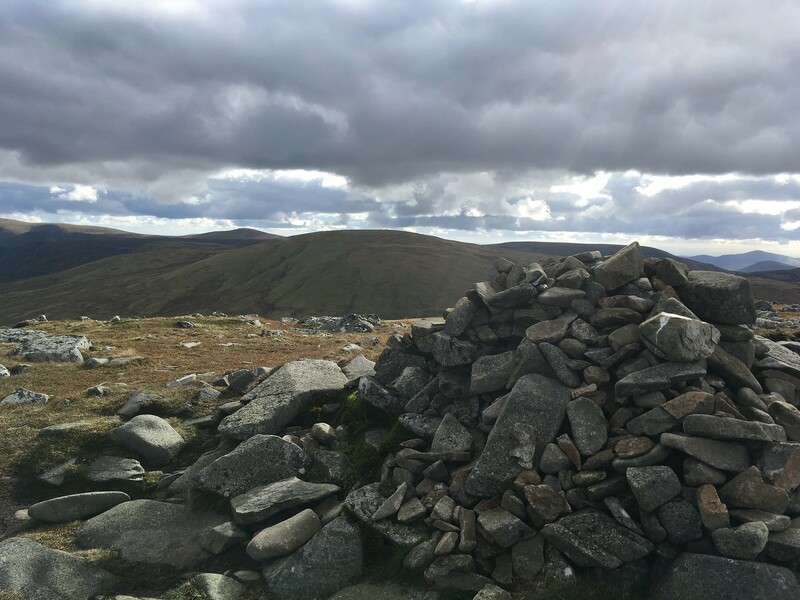 I had a spot of lunch on the summit of Tolmount and then followed a path heading roughly in the direction of Jock's Road. I could probably have picked a more direct route to Crow Craigies, but I'm always happier following a path! 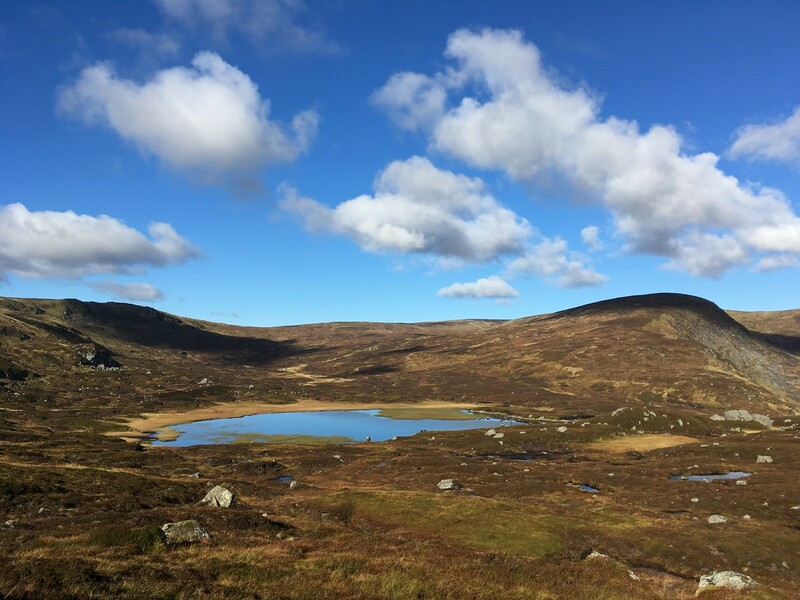 On this stretch I caught a brief glimpse of Loch Callater. 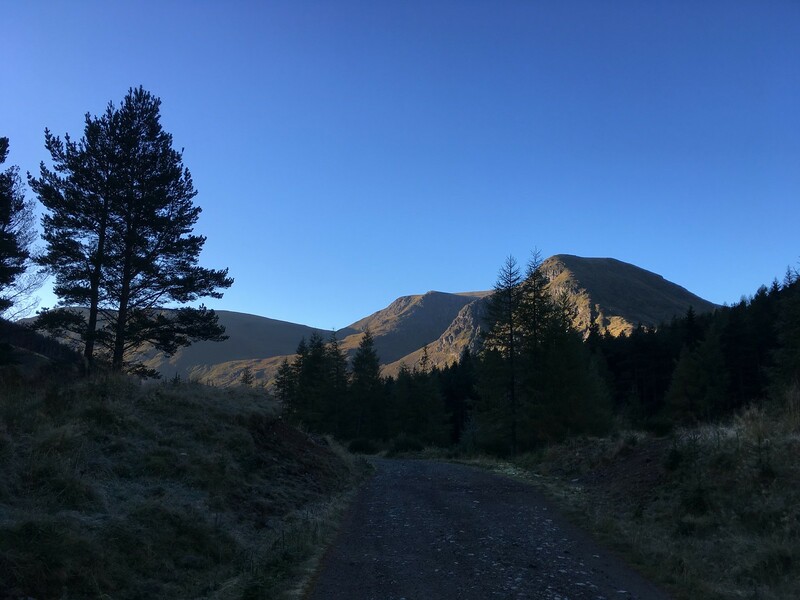 Having now picked up Jock's Road, it was just a matter of heading across Crow Craigies (basically a jumble of rocky outcrops, easily negotiated) and then joining up with my outward path. I almost decided to stick with my original plan and follow Jock's Road back to the car park, but I had to see if I could find my lost bins - they weren't top of the range, but they weren't cheapo rubbish either. So off I trudged...of course when I got to where I thought I'd stopped for breakfast I couldn't really pinpoint the exact spot, and having checked out all the likely spots there was no sign of them...at which point of course I wished I'd just stuck to my original route after all! So it was a longer and more frustrating walk than it should have been, but that was my fault. 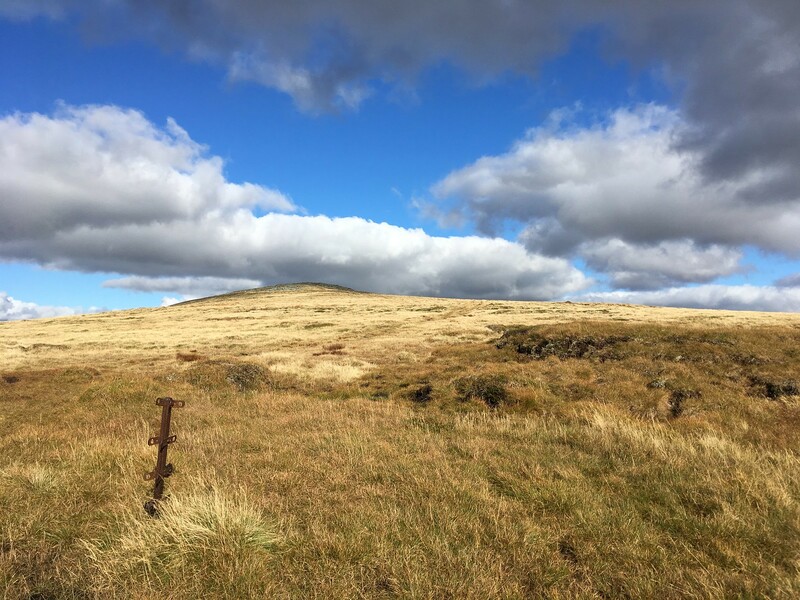 This is a really nice walk, and the return via Jock's Road would have knocked about an hour off the time I reckon. ps If anyone finds a pair of compact Nikon binoculars at roughly NO 263791 they're MINE! 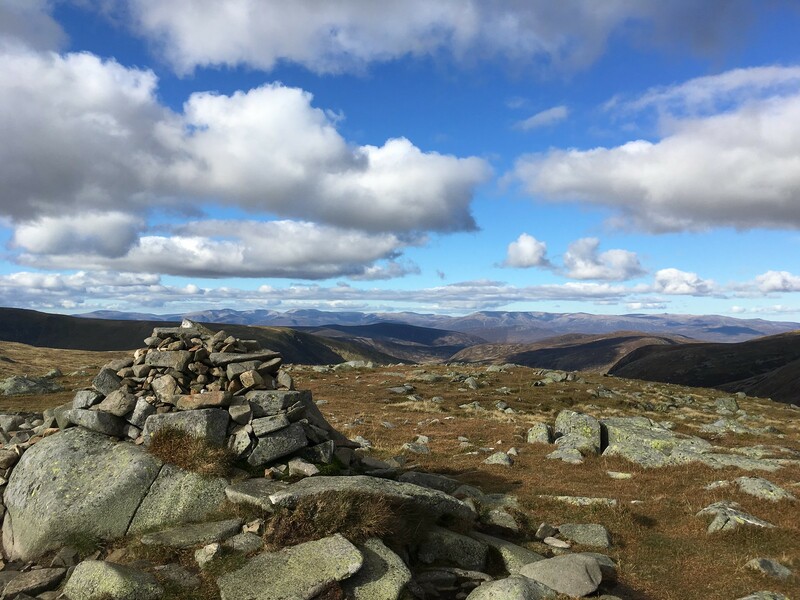 I done these Munros as part of a larger walk but and bumped into a group of people on Tom Buidhe celebrating someones celebration having just completed a the Munros. I kinda felt sorry for him it was on such a garbage hill but he didn't mind, it was a local hill for him and it meant more of his loved ones could tag along as it's a relatively easy hill.